Are you looking for a way to effectively promote your event, political campaign or business? When you use yard signs, also known as coroplast signs or bandit signs, you’re given a fantastic way in which to advertise special events or educate potential clients or customers about the services or products you have on offer, along with supporting your favorite candidates without having to spend a lot of money. Carolina Custom Signs & Graphics, provides the quickest and most affordable yard signs that anyone has to offer! Our customized manufacturing process along with state-of-the-art equipment allows us to create any type of banner, yard sign or any other type of promotional signage that your organization or business needs. Call Carolina Custom Signs & Graphics today at (336) 252-2032 for your Free Consultation with a Yard Sign Specialist! Regardless of the type of business, you are in yard signs have been proven as a highly effective business marketing tool. 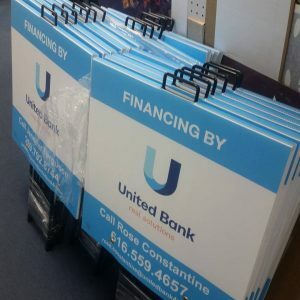 We specialize in crafting attention-grabbing, unique and innovative yard signs to quickly establish your specific brand as well as maximize the visibility of your company, whether you happen to be a non-profit, service provider or retail store enterprise. As a complete signage shop, we handle every aspect of your signage process including custom designs. We also welcome any ready-print files along with offering same day or the next-day production, dependent on the number of signs you have ordered. With our skills, knowledge, and tools we offer full-color signage or single-color prints while working quickly to complete projects with efficiency, correctly and on budget. 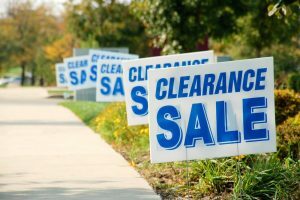 There are various businesses that make use of yard signs, yet there is one market that is well-known as the biggest user of these signs which includes the real-estate agents. 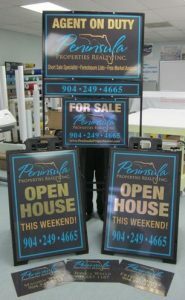 This industry uses the yard signs to advertise homes up for sale, open houses, businesses on sale, along with customized yard-signs that promote their specific brand or offer additional information like brochures or flyers. We not only offer customized signs, but also produce attractive and unique real-estate sign-holders, along with other types of signage such as lobby signage, outdoor banners, storefront signs, and more. It’s our goal to become your preferred provider in association with every real-estate signage requirement you may have. The yard signs serve more than just a purpose for real-estate or business use, these signs are also highly popular during the election season as they are portable and inexpensive. Most candidates make use of these yard signs for their convenience as well as a way to increase visibility. In many cases, these yard signs will be given away in rallies, handed out to supporters, made available to order from your own campaign website or handed to the candidate when they canvas local neighborhoods. The visibility that these signs are able to generate when it comes to campaigns as the potential voters see or pass by them results in a significant increase in name recognition, which offers you an improved chance when it comes to obtaining more votes. You don’t have to worry about placing your order online and then waiting for a number of days with the hope that all your details are correct. Our signage shop provides local pick-ups and fast services, and we can also offer samples to ensure you are receiving the best products for your needs, Give us a call today!